In 2018 Trout Unlimited recently kicked off a new pilot program, Seasons on the Farm, in partnership with the Lower Grand River Organization of Watersheds, Plainsong Farm, and the Kent Conservation District. Seasons on the Farm aims to provide practical, immersive farm-based environmental education for middle school students in the Rogue River watershed. 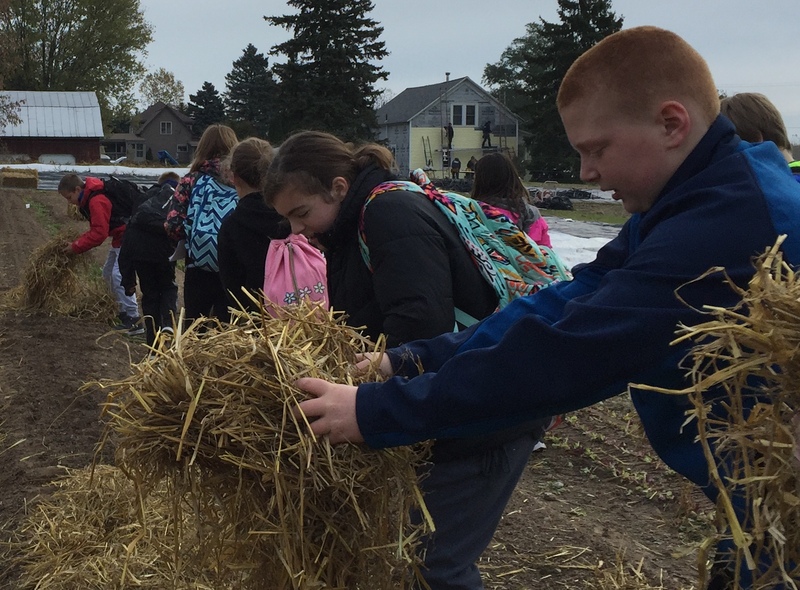 Through a series of hands-on field days and the associated curriculum, students will be exposed to sustainable agriculture and natural resource conservation throughout the school year both inside and outside the classroom. Plainsong Farm, a local CSA farm in Rockford, will be the hub of the program and provide a place where teachers from the watershed can bring students of different backgrounds for shared experiential learning and practice. With funding from the Wege Foundation, nearly 250 students and five teachers from Sparta Middle School and East Rockford Middle School are participating in the program this year. The first field days of the program started in October and highlighted some common fall farm activities. Students dug soil cores to analyze soil health, planted garlic and used mulch for water conservation, spread seed for cover crops to reduce erosion, and searched for bumblebee habitat to learn how to increase pollinator populations. This approach to learning offers students an opportunity to participate in real-world problem solving and contribute their service to Plainsong Farm. Students will continue to learn back at the classroom through lessons incorporating these themes and will return to Plainsong Farm for more field days this winter, spring and early summer. With nearly half of the Rogue River watershed being agricultural land, it’s imperative for students to understand the importance of this land use, to observe hands-on what farmers can do to protect the land and water resources, and to gain the knowledge necessary to become a future generation of watershed stewards who can advocate for responsible land use practices.